Shoreline Area News: Where is Fred Rogers when you need him? Where is Fred Rogers when you need him? It’s hard not to watch “Won’t You Be My Neighbor,” and not come away philosophical. This documentary about a human being of seemly infinite grace who became a PBS icon for children puts you in the mood to be reflective and thoughtful about the world in which we live. While I do help people use their computers more creatively and effectively, I seem to also spend a lot of time protecting or recovering people from tech scams, identity theft and other malicious acts. Of the five different type of talks I am currently offering at Sno-Isle libraries through their Tech Pros program, only two topics fit into the creative/effective column. On top of that I had just finished a class on fake news in October (Rumor Mill: How to Find Fact from Fiction on the Web) for the Creative Retirement Institute (EDCC). There I had to show example after example of the vicious fictions created by people feeding the paranoia of their ideological base, picking at the character of anyone who disagrees or simply seeking to profit from the fear and uncertainty generated by incomprehensible threats. Okay, that sentence was long. It was also depressing. I am sure that some people’s reaction to all this is to crawl to the nearest corner and assume the fetal position. So, I was in the right state to see Fred Rogers again in the Oscar-winning documentary by Morgan Neville, (available through Amazon Prime, ITunes, King County Library, Sno-Isle Library and the Seattle Public Library). It was a great antidote to the fake news, public displays of disrespect, and the tendency of people to think the worst of their fellow human beings. Fred loved people, especially children and thought the best of them. Though Fred died 15 years ago, I know he would be appalled at the relentless pace and vicious content we are hit with every day. But, I don’t think he would get caught up in it. And then, he would be prepared to listen. That first part is something most people can understand intellectually. The second part is the hard part, though. Opening yourself up to hear someone is risky, but it is also the secret step to stopping the endless battle and beginning a true dialog. Are People Worth the Effort? In writing this, I am reminded of a story told by one of my Tech Support Scam attendees at the Marysville Library. As he recalled the story, a phone scammer called an intended victim who started asking the scammer questions, not about the scam but about the scammer himself. Sometime later the scammer called this person back, stating that their phone call changed his life. He quit the scam, gained a legitimate job and learned in the process that he was a better person than he thought he was. Is the story true? I have no idea. I can only hope it is. Am I suggesting that everyone try to do this? No. This was likely a special circumstance that both people were “primed” to pursue with a positive outcome. If the circumstances seem right, perhaps. Oftentimes we aren’t looking for an opportunity for something like this at all. That was the situation for Ben Taylor from Ogden, Utah. Ben has a You-Tube channel where he has, among other things, attempted to scam scammers. Ben started to communicate with the scammer (Joel) who initially wanted to receive electronics shipped through a third-party at a suspicious address in the US. 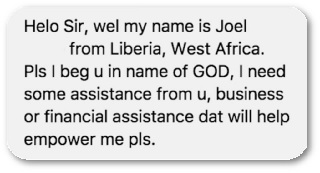 Over the next few months of interaction, Ben purchased a camera and sent it to Joel, telling him he would pay for pictures of Liberia. While the first set of pictures were poor quality, Joel practiced and finally started sending very nice pics. Then Ben took the good pictures, made a photo book (By D Grace of God) and started an Indiegogo campaign to sell the book for $10. They sold over 1,000 books to people in 40 different countries with Ben splitting the profits 50/50 with Joel. Ben then donated his profits to Joel’s village, having Joel manage the purchase and distribution of school supplies to the poorest children. If this amazing story ended at this point, it would have been enough for most. Ben and Joel’s story went viral. To continue book purchases and offer more merchandise, Ben started a webpage: bydgraceofgod. Donations and purchases helped Ben travel to Joel’s village and distribute more assistance to the people of Liberia. It certainly changed the lives of a onetime Liberian scammer and his American business partner forever. Book and products are available here. 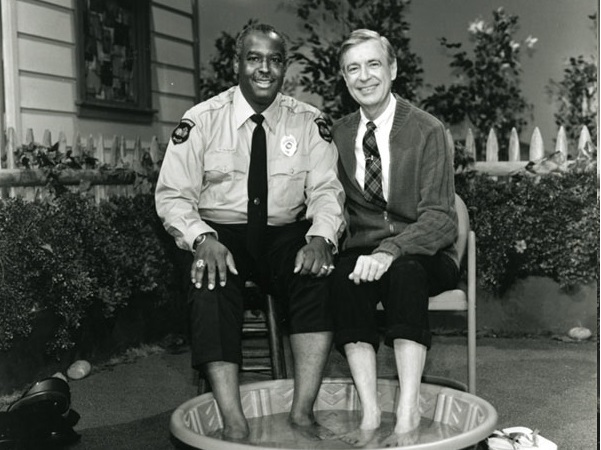 With stories like Ben and Joel, perhaps I have my answer to “Where is Fred Rogers when you need him?”. The essence of Fred’s approach was to believe that people are inherently good. They just need to be understood and supported so each one could be “as good as they could be” as Fred would say. When an opportunity presents itself and things align, Fred seems to be there for me. Maybe he can also be there for others. We just need to see the signs and open our hearts to those moments. When not thinking about we can treat each other better or occasionally contributing to the Shoreline Area News, Brian Boston helps individuals and groups with technology and offers classes through the Sno-isle Libraries, Computer Q/A at The Commons and the Creative Retirement Institute at Edmonds Community College. More information at bostonlegacyworks.com.